Surrounded by Pinon trees in Torreon, this single family home offers comfort and absolute tranquility. Whether your looking for relief from the summer heat or just quiet family time this property location offers golf, horseback riding, fishing, mountain biking, or any number of outdoor activities within a short distance of this beautiful retreat. This meticulously maintained 1600 square foot home features a master suite, guest bedroom, office den/bedroom, 2 bathrooms and an indoor laundry facility. The covered deck is great for BBQ's, reading a book or just relaxing under the stars in your private Jacuzzi tub. The home is comfortably furnished with 1 king, 1 queen, & 1 sofa bed. 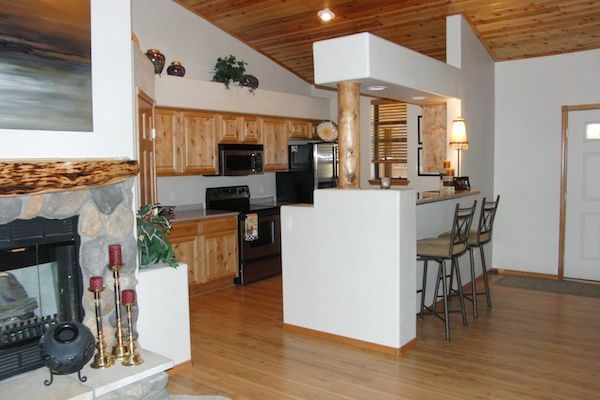 The kitchen is fully equipped; bedrooms and baths are beautifully appointed for a cozy home away from home. Expect all the amenities; wireless Internet, Direct TV, flat-screen TV & DVD player for late-night movies. Enjoy, private day or evening socializing on the comfortable outdoor furniture; back deck includes a TV, jacuzzi and gas grill. Property located inside gated community. This property is exceptionally well located to a Starbucks, Safeway, CVS, gas station and several restaurants. Hop in the car for a 30 minute drive to Hon-Dah Casino for some cards and slots action! 100% refund for cancellations more than 90 days before check-in date. 50% refund for cancellations less than 90 days before check-in date. So come and experience the glorious mountain atmosphere surrounded by Pinon trees in the heart of Torreon. Single garage stall available for vehicle. The home was beautiful and well maintained. When we walked through the front door, we had a warm feeling and it felt like home. We couldn’t have been more pleased with our 2 month stay. The house was perfect. Very clean and had all of the amenities we could ever want. Booking with the owner Michelle was a smooth and easy process. We enjoyed watching the playoff games on the patio and sitting in the hot tub at night. We brought our dogs and they enjoyed going for walks in the community. We will definitely be back! Thank you for taking the time to write your review of our property. Your comments are extremely valuable to us. We strive to create a comfortable home experience for our guests, and we're happy that you were so pleased. Please keep us in mind for future trips to Torreon. The house is very pretty and comfortable. My first morning 3 bull elk wandered behind the deck so that was a welcoming sight! The owner was available and helpful. Torreon is a wonderful community. Very quiet, nice walking trails, and easy to follow directions. Would certainly recommend this home. We really enjoyed our stay at this beautifully appointed cabin. The kitchen was very well equipped and the furniture and beds were comfortable. Unfortunately the hot tub did not work but Michelle, the homeowner, was attentive to our request to have it repaired. Definitely recommend this property for a family getaway. The house was exactly as the photos, but much nicer! Everything was clean and just like walking in the door of your home. Very spacious and comfortable. The beds were wonderful as well as all of the linens. The kitchen was completely supplied with everything you could possibly need. It is located on a quiet street tucked into the ponderosa pines. And, it was a real treat to enjoy my morning by sitting on the back deck enjoying the cool air. I hope to return again next year. Thank you for taking the time to write such a wonderful review. We are pleased to hear our home met your expectations. Our goal is to provide a ''Home Sweet Home' vacation experience. It was such a pleasure working with you. We look forward to welcoming you back again in the near future. We have stayed at many vacation rentals over the years and we agreed that this one was one of the BEST! The house is in perfect condition, very tastefully decorated and extremely well appointed! The kitchen did not lack anything you might want to prepare very special meals. The Torreon amenities are first class of course and this property lives up to that standard. We will be back! We are pleased to hear you enjoyed your stay in Torreon. We strive to create a home away from home! We thank you for choosing to stay with us and look forward to your return! Rates are subject to change until reservation is confirmed. All Rights Reserved. Holiday Rental (3 night's minimum) with the exemption of July 4th requires a 1 week minimal rental. $100 Damage Deposit required and refundable if no damage. $200 Pet Deposit required and refundable if no damage. $85 Exit Cleaning Fee Applies. Rentals of 4 nights or more are subject to an excess utilities surcharge.